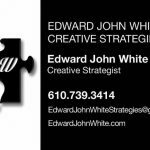 I am a creative strategy consultant. I have a college degree in journalism with a minor in business and a law degree. I also have more than 40 years of professional experience in a variety of fields, including more than 25 years as an attorney, more than 10 years in journalism, public relations, entertainment, and marketing, three years in banking, more than 40 years as a volunteer and board member of nearly a dozen nonprofit organizations, and nearly 40 years of experience as a volunteer and staff member on various political campaigns. My business is to help you solve your problems.